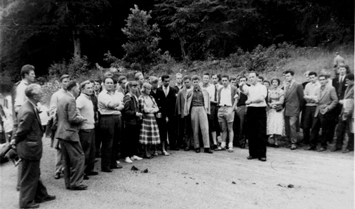 In 1955 a full-scale international student conference was launched by the society, which by this time had adopted the name Pembroke Dock International Friendship Society. Invitations were sent out through London and continental organisations, and applications flooded in. The journey from London to Pembroke Dock, in addition to the other travelling expenses, made the total financial outlay considerable for the students and we felt that there was need of a subsidy. We were too few to arrange sufficient money-raising events so the society distributed, through the children of the school, a pamphlet explaining the aim of the conference, and asking people to support us by contributing at least 2/6d. and becoming associate members. The money came in gradually and amounted to between £100 and £200 annually, much of it from individuals. A place to hold the conference was needed and the Pembrokeshire Education Committee gave us free-of-charge a portion of the school at Pembroke Dock. The First World War cabins, which had been used as class-rooms, were scrubbed, windows cleaned and curtains made by staff and pupils. Blankets, mattresses and beds were scrounged from the Army, RAF, YHA and local hospitals and placed in the cabins. Menus were drawn up and the school cooks were enlisted. Enthusiasm often outran reason, but the plan was good and it could do nothing but succeed with a whole community to sustain it. The sun shone daily. There were seventy young people from about fifteen countries. It was ten years after the war in Europe had ended and these teenager students were amongst the first to leave their countries since the peace was declared. There was a tremendous feeling of camaraderie amongst all the participants and gratitude that they were being welcomed by the community. The programme of lectures, discussions, trips around the countryside and social activities swung along with gusto. The evening given over to entertaining associate members of the Society was especially successful. It included, amongst much else, the performance of a play in English by the foreign students and the presence of Sir Frederick Rees, Principal of Cardiff University, who was one of the society’s patrons. In 1956 the conference moved with the school up to its new premises at Bush and was held there annually until 1965. The 1965 Conference, the twelfth in the series, was more sophisticated and better planned but it was the same in its essentials. It still relied on a crew of about twenty pupils of the school to transform the school into a conference centre in about two days with sleeping and lecture accommodation in classrooms, and scrounging around for the loan of bedding, blankets and beds from the army and other organisations. There were 80 students present this year, coming from Austria, Czechoslovakia, Denmark, France, Germany, Hungary, Italy, Netherlands, Norway, Poland, Spain, USA, Yugoslavia and Britain. They came directly to the Conference and the majority returned home immediately afterwards. There was also a group from the Commonwealth countries who were resident as students in Britain. A number of the British students were pupils of the school, as had happened during each conference. The ages ranged between 18 and 25. The majority were from universities and other establishments of higher education with a sprinkling of sixth formers at one end and graduates at the other. A number were attending for the second time. They were, as always, a stimulating and inspiring group and it was a joy to be in their company. A good working knowledge of English and an interest in international affairs were the only conditions of acceptance. The general theme of the lectures was ‘Sources of Internatonal Conflict.’ The inaugural lecture was given by Professor Kirkwood, Professor of Race Relations at St.Anthony’s College, Oxford, who spoke on the origins and history of racialism. Racialism was further explored by an American sociologist, Mrs.Paschall, who spoke of the situation in the U.S.A., then by Mr.Spence, a lecturer at Swansea University College, who was himself a South African and dealt with apartheid, and by Miss Peppard, Advisory Officer of the National Committee for Commonwealth Immigrants, who spoke about the situation in Britain. The general problem of prejudice and intolerance was dealt with in a lecture by Mr.Polack, Secretary of the Council for Christians and Jews. Other world problems addressed were: ‘Vietnam’ and ‘Soviet and Chinese Communism’ by David Steeds, a lecturer at Aberystwyth University College; ‘Divided Germany in a Divided Europe’ by R.A.Speed, a lecturer at the Dacorum College of Higher Education; ‘The Proliferation of Nuclear Weapons’ by Dr.John Burton, a lecturer at the University College of London; ‘The Conflict between Capitalism and Communism’, a lecture by Mr.Mogilevchik, an Attaché at the Embassy of the USSR in London. There were in all 18 lectures by visiting speakers. Amongst the most distinguished of our speakers had been Professor Sir Joseph Rotblat. He attended our conferences in 1960 and 1964. Born a Polish Jew, he and his family suffered greatly during the First World War. He was determined to succeed in spite of the racism which he suffered. In 1939 he moved to Liverpool to work in the field of nuclear physics with James Chadwick, the scientist who discovered the neutron. In the meantime he suffered a great tragedy. He failed to get his wife out of Poland and she died later in the holocaust. In 1943 he was recruited to work on the Manhattan Project, which later built the nuclear bombs that were dropped on Hiroshima and Nagasaki. In 1944 he left the project on moral grounds, once it became clear that Germany was not building the bomb. He was accused of espionage and left the U.S.A. He went on to pioneer the use of radiation in medicine and to working tirelessly to realise his dream of a world without nuclear weapons and without war. Together with the Pugwash Conference of concerned scientists, he received the Nobel Peace prize in 1996. He was persistently optimistic, and believed that young people are the key to finding solutions to society’s problems. Originally a poor marginalised boy, he ultimately influenced the course of history. These are his words in 2004: ‘How can we ask the young generation to abide by a culture of peace, if they know that this peace is predicated on the existence of weapons of mass destruction? If we want to get rid of terrorism, we must also change our culture, the culture of violence, which permeates society in almost every walk of life’. One Conference day was always set aside for the participants themselves to speak about their own countries. There was also a full programme of social activities, of dances, sing-songs, entertainment by local groups, and walks and trips around the countryside. And one afternoon and evening was always set aside to entertain the children and adults who were members of The Pembroke Dock International Friendship Society, each of whom had paid a contribution of at least 2/6d membership fee. There was a great enthusiasm amongst the conference members for this and they were really thrilled to know that the locality had welcomed them so warmly. In 1965, Islwyn Griffiths, the Honorary Secretary, obtained a teaching post at the College of Education at Caerleon, Monmouthshire. It would have been impossible for him to continue to organize the Conference at Pembroke from this distance and it was re-established in 1966 at the Caerleon College with the complete co-operation of the College Governors, Monmouthshire Education Committee and its Director of Education, as well as that of the Principal of the College, Mr.Gwilym Ambrose. The conferences were staffed by William Smith and Graham Phillips, pupils at the Pembroke Grammar School, and Julian Jones, Stephen Griffith and Islwyn Griffiths, members of the staff at the school.